By Cole Rosengren. From left to right, candidates Rafael Salamanca, Julio Pabon, George Alvarez, Marlon Molina, J. Loren Russell and Joann Otero. 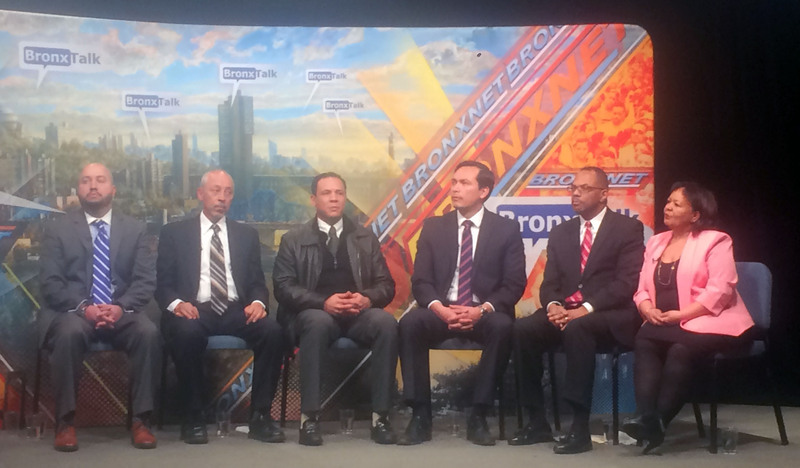 A candidate debate for the vacant City Council seat in District 17, taped for BronxNet on Feb. 12, frequently came back to the question of which candidate could best challenge the political status quo. After Maria del Carmen Arroyo’s sudden resignation in December, the district will have its first new representative since 2005. Rafael Salamanca, district manager of Community Board 2, continues to rack up high profile endorsements from elected officials. 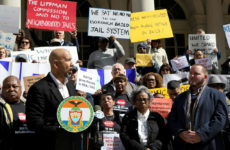 The Bronx Democratic County Committee has thrown its might behind him and was behind legal challenges that knocked five candidates out of contention. Six of the original 11 candidates will appear on the ballot on the Feb. 23 special election. In alphabetical order, they are: George Alvarez, Marlon Molina, Joann Otero, Julio Pabon, J. Loren Russell and Rafael Salamanca. Moderator Gary Axelbank began the hour-long forum by asking candidates whether the district would do better under a council member who could work within the current system or wanted to change it. Salamanca didn’t shy away from his influential supporters. “I received these endorsements not because I was friends with anyone. I received these endorsements because of the work I’ve put in,” he said. Yet other candidates took issue with how the special election process has played out. “Do you want county attorneys and his campaign deciding who you can vote for or do you want to make a choice for yourself?” asked Marlon Molina, who said his ballot petitions were also challenged. 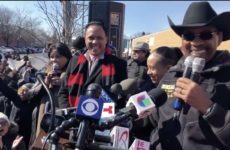 Julio Pabon,who opposed Arroyo in the 2013 Democratic primary, noted his history of community activism and positioned himself as an alternative to county politics. When the candidates were asked which Democrat they would vote for on the presidential ticket, Pabon was the only one who named Bernie Sanders over Hillary Clinton. He framed his candidacy in similar terms. “What we need is an outsider. We need someone who can bring in new ideas, fresh ideas,” said Pabon. Much of the discussion focused on who could best protect the district from the looming potential of new development. Reverend J. Loren Russell, who in addition to his ministry also runs a property loan business, said community involvement is the key to making sure residents aren’t displaced in the process. 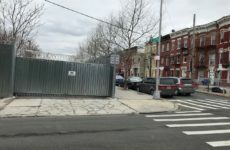 The candidates also had misgivings about the income levels residents in the district would be expected to earn under Mayor Bill de Blasio’s affordable housing plan. Whoever is elected will have to vote on details in the plan in the City Council as soon as next month. The candidates tried to balance changes in the neighborhood with existing crime rates, public housing disrepair and homelessness. Joann Otero, Arroyo’s former chief of staff who grew up in the Moore Houses next to St. Mary’s Park, said the Housing Authority must get more creative in its search for funding. She mentioned solar panels as an example, but added that the issues go beyond money. In closing, Salamanca reiterated that his work as district manager to pressure the state to shut down strip clubs and the MTA to add a new bus line so New Yorkers could more easily reach the peninsula’s isolated city parks make him the best person to represent local constituents. “I will go to City Hall and be that advocate,” he said. Pabon closed by saying that the council member shouldn’t just occupy a position, but should help enable residents to change the district they live in. After the forum, he said that would include later office hours and partnerships with tenant organizers. Candidates will participate in one more forum at 5 p.m. on Feb. 18, 1189 Tinton Avenue.